I’ve drawn a number of different breeds of dogs over the years, but never once a Jackhuahua. 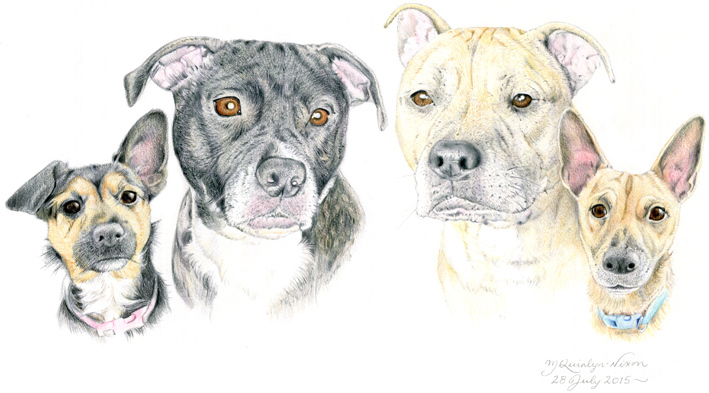 So, when a friend and ex-colleague, Marsha Lally, asked me if I would draw her Mum’s four dogs, I didn’t realise that I would be drawing not just one Jackhuahua, but two, as well as two Staffordshire Pit Bull Terriers. They say things come in threes, but these dog breeds came in twos. I tend to be quite selective about the photographs I use in my illustrations, but because of the distance and limitations on how far I can travel, I asked Marsha if she could supply me with a range of different images to choose from. Images were supplied and I tried to choose four that would make a successful canine montage. One should not have favourites, I know, but I have to admit that Gizmo (the black-and-tan Jackhuahua on the left-hand-side of the picture) was my favourite dog of the four, although I did enjoy drawing Ruby (the third dog along) the most. As the commissioned illustration was a surprise birthday present for Joanne (it was belated because the amount of work I had on at the time), it was all kept rather hush-hush. I was told that the picture, when presented to Joanne was a great success, so all of the planning and secret preparation was not in vain.